It&apos;s the middle of the year, so Complex is looking back at The Best of 2010 (So Far) with a series of features that highlight our favorite stuff from the world of entertainment, fashion, art, and more. Ask anyone about sneakers in 2009, and you get a rather wet napkin-y response: "Ehhhh. There were Kanye&apos;s releases and the Space Jams, and then a bunch of &apos;nice&apos; sneakers that came out." The new year has been quite the opposite, with high-quality heat drops and good spacing between releases. From the debut of Converse First String to great Jordan VIs to the Air Max Attack Pack, the theme of 2010 has been more about good shoes than limited 50-pair releases. 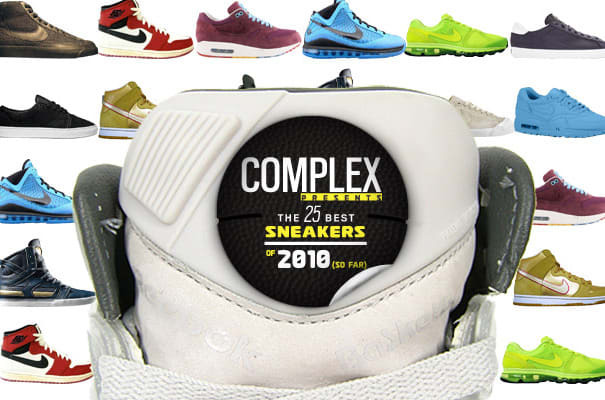 We took a close look at the blogs and a lot of the actual sneakers that were released BEFORE July 2010 to come up with the straight-up 25 that we can co-sign with authority. Check it out.